Kent Williams is seen on the stand in this courtroom sketch from Thursday, May 3, 2012. The best friend of Oscar-winner Jennifer Hudson's brother testified Thursday that Jason Hudson only had one enemy. "That cat," Kent Williams said, pointing to William Balfour. Balfour, 30, is charged in the shooting deaths of Hudson's mother, Darnell Donerson; her brother, Jason Hudson, and her 7-year-old nephew, Julian King, in October 2008. He's pleaded not guilty. Williams told jurors that Jason Hudson didn't carry a gun with him outside the family home. He was moved to tears when he told the courtroom that receiving the call about his friend's death was "the worst thing I've heard my whole life." Williams testified that he'd often stayed with friends in an apartment building near his own home. Balfour, he said, often also stayed there. After one fight in the neighborhood, Williams said he searched through a closet where he knew his friends stored a handgun. "I was looking for a Glock .40," he said, "But I saw 45 shells." Jason Hudson was killed with his own .45 calibre semi-automatic, a gun allegedly stolen by Balfour. Williams also conceded that his friend was a small-time drug dealer, but wasn't a significant one and didn't owe anyone money. When asked by prosecutors if Jason Hudson had any enemies, he pointed at Balfour: "Besides that cat over there... no." There so far has been little physical evidence linking the defendant to the crimes, and experts say testimony like Williams' can help prosecutors bolster their case. "The prosecution has to empower the jurors to connect the dots. They're saying, 'Look, this is a bad guy. He wanted this to happen. He had the means to do it. Yeah, we didn't find the smoking gun -- literally -- but use your common sense,'" jury consultant Alan Turkheimer told NBC Chicago. 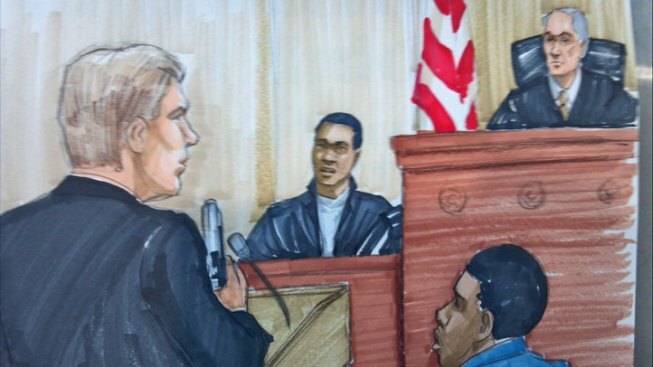 Wednesday's proceedings included testimony from a forensic scientist who said that while there was DNA evidence found on the handgun identified as the murder weapon, there wasn't enough to link the gun to Balfour. In another new development, journalists covering the trial will not be able to bring their cell phones into the courtroom. The judge had allowed the occasional email to be sent, but when a phone started ringing, he banned them from court. Thursday's proceedings began later than normal because of some matters that required the attention of someone on the trial team.